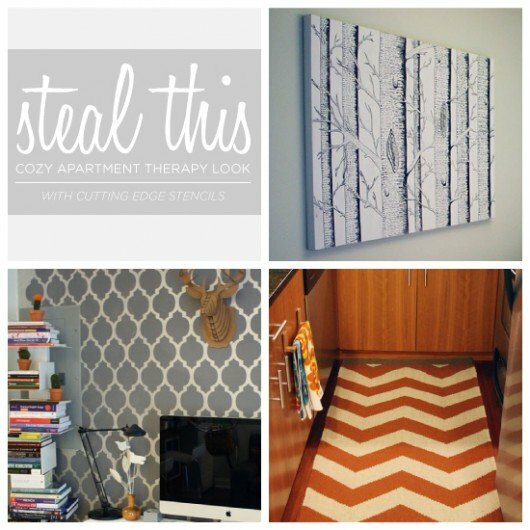 Stencils and Color Combinations to Steal This Cozy “Apartment Therapy” Look! Good morning, my stencil lovin’ friends? Cutting Edge Stencils is having a T-riffic Tuesday, especially after yesterday’s NEW stencil release! Have you seen them? Make sure you check out all the newbies here and then tell us what you think in the comments below. Cozy yet inviting is how we see this kitchen. We love how she’s added splashes of color using decor accessories. That adorable accent rug could easily be replicated with a little help from one of our stencil patterns! To STEAL THE LOOK of the rug in this kitchen, use Cutting Edge Stencils’ Chevron Allover Stencil, a zippy striped design. Consider stenciling a color like Benjamin Moore’s buttered yam AF-230. This delicious deep orange fosters the good feelings of home and happiness, making it the perfect choice for a kitchen rug! Check out this tutorial on how to stencil a rug. Now this look is not as hard to steal! 🙂 This gorgeous Moroccan stenciled wall happens to be one of our stencils. JoAnn added a little pattern punch to her living room by stenciling an accent wall. Do you love it? Good, then let us tell you how to get this gorgeous look! To STEAL THE LOOK of the living room, use Cutting Edge Stencils’ Casablanca Allover Stencil. First paint your wall a neutral gray color like Benjamin Moore’s rock gray 1615 and then stencil the Moroccan print in simply white OC-117. The result as you can see is absolutely stunning! Watch this video on how to stencil an accent wall. We love wall art and better yet we love stenciling wall art. JoAnn’s friend crafted her the tree ink drawing that she proudly displays in her bedroom. If you love this look but don’t have a crafty friend like JoAnn does, then we have the perfect solution! To STEAL THE LOOK of this wall art, use our Beautiful Birches Stencil in a deep, dark blue hue like Benjamin Moore’s hale navy HC-154 over a white like simply white OC-117! Easy peasy and you’ll create gorgeous looking wall art! Here’s a detailed tutorial to walk you through the steps. We told you this cozy home tour was pretty UN-believable. See the whole house tour here. Which of these cozy looks would you be most likely to “Steal”? Leave us a comment below!